While wandering around the Modern Art Wing one day, I promised myself I'd return to these two paintings tucked away in the back corner near the staircase that leads to the mezzanine and the second floor. I'm sure my photographs don't do them enough justice, but you might be able to tell that they are remarkable. At first glance, both are beautifully rendered landscapes, with a natural palette that evoke a sense of calm and serenity. But then you notice the handwritten words etched over the surface, most beautifully in the foreground of The Oxbow, which look like rows in the fields of the farm to me. 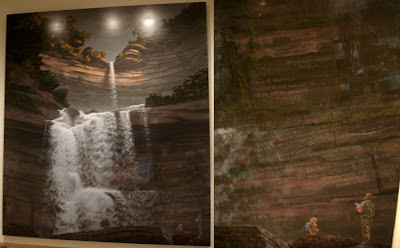 These are paintings by American artist, Stephen Hannock. 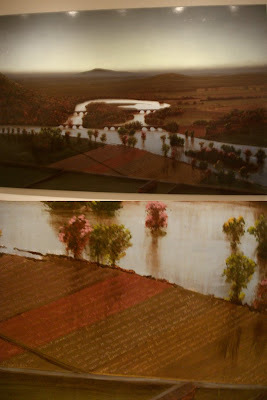 The Oxbow: After Church, after Cole, Flooded, Green Light references Thomas Cole's famous Mount Holyoke, Northampton, Massachusetts, after a Thunderstorm-The Oxbow, also at the Met. The Oxbow was recently replaced by Kehinde Wiley's "Veiled Christ," but I am sure it will reappear on the walls of the museum sometime. For more in-depth information, Hannock's web site has this catalogue essay that describes the artist's style and inspiration. Also, CNN Money/Fortune Magazine featured Hannock in Portrait of an A-List Artist. Thanks for posting this and for getting more in depth about these works. I plan on checking out the catalogue essay and the magazine article. and Salvador Dali - The Accommodations of Desire; and the Crucifixion. There were some pieces there that I just didn't understand. One was "Woman gringing coffee". I enjoyed seeing all the works because I would rather be exposed to them and later figure out why those pieces were so significant. I also do some research into the the people that owned some of the art... just to get a background. For example the artist Balthus and noticed he did a painting call Pierre Matisse who with his wife owned a large collection. Pardon my being totally out to lunch.... but.... who are you???? And do you really get to go to the Met everyday...? I am green with envy. Also, how can I contact you..? Many thanks for the kind attention you have given my work...and particularly to Frank Moore and his uncle Dan Hodermarsky. And for a real treat, wait 'til you learn about Betty and Agnes Mongan...to whom many pieces from the Oxbow series have been dedicated. I apologize for being so out-of-it..... but Who Are You...? ..and do you really get to go to the Met everyday? I am green with envy. Many thanks for your comments regarding my work, and particularly regarding Frank Moore and his Uncle Dan Hodermarsky, both of whom left us much too early. Also, you are in for a treat the more you learn of Betty and Agnes Mongan to whom my Oxbow series is dedicated. 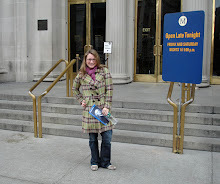 I'm just a girl in New York City who happens to love the Met. I go as much as I can, though I'll admit to slacking now and then. If anyone is envious, it is I, since you are an incredibly talented and successful artist. I was glad to see they put the Oxbow back next to your Waterfall, they belong there together. Looking forward to visiting them and their peers at the Met again. While in NYC on my honeymoon, we spent some time at the Met and I also was captivated by Stephen Hannock's work. I'm trying to find some kind of print of his to purchase, besides buying an original (which I'm sure I couldn't afford). I was thinking of a poster or even a calendar . . . Any ideas on where I could find something. I've been searching the net (which is how I found you) and have not been able to find anything as of yet. Enjoy your days at the Met. It is truly an amazing place. Hmmm... I will see if I can find anything for you. I do know there is a beautiful book that recently came out, called Stephen Hannock. I cherish my copy - it has beautiful gatefolds and is really informative on the artist's life and process. Congratulations on getting married! Send your email address so that I may update you if I find anything else available.